I've been experimenting with blends. I'm not entirely sure I'm doing it right. Is it sacrilege to roast different kinds of coffee together? After trying umpteen different coffees together, I finally hit on one I really like. I've been keeping records and rating the different coffees and blends on a basic ... very basic ... scale, giving each a number 1-10 based purely on whether I like it or not. I've only one batch in the negative numbers, way over-roasted and disgusting, might have been better used as kindling chips in the fireplace. And I've had a few batches that were down in the 2-3 range. Most have been in the middle numbers, tolerable, but nothing that really grabbed me. This latest blend, however, is stellar. 80% Sumatria Classic Mandheling, and 20% Yemen Mokha Sana'ani produces a deeply mocha coffee, not just chocolately, but deeply darkly chocolatey. I've tried this blend lightly roasted, medium / full city, quite dark, and something in between, and frankly, they're all good. The mocha flavor is most apparent in the medium roast, so that would probably be my first choice. I am still frustrated by the inconsistencies in roasting. I assumed that once I found a good bean and darkness, I could set the roaster and walk away. But that's just not so. The exact same level of beans (from the same batch), roasted for the exact same amount of time does not always produce the exact same darkness of roast. It's maddening. I have no idea what other factors are affecting things - humidity? It has been more humid than usual here lately. And if the air conditioner kicks on in the middle of roasting, does that draw from the power needed for the roaster? I'm not tech headed enough to know if that would make a difference, or what else to pay attention to. Any advice? I know it's an old post...Just listen, look, and smell. Professionals do not walk away from the roaster, either. Thanks for your mocha java recipe. Yikes, I've been considering getting into roasting but I'm probably not ready after reading this. I'm intrigued by the mixing you talk about though. Love the website and I love the recipes you have in here! I've got some really great tasting beans and biscotti on my site that I would love for you to try! They are made fresh to order - really delicious!! 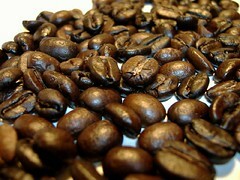 Brew double strength Columbian coffee by simply adding 8 tablespoons of ground coffee to every 12 ounces of water. Fill your electric blender half way with your chilled Columbian coffee and add the cracked ice. This recipe will give you approximately 4 servings, if you need more than that simply double or triple the recipe to suit your needs. This will became a fast favorite for the Columbian coffee lovers in your life. Give a try to know the real taste. I love the recipes you have in here! I've got some really great tasting scones and biscotti on my site that I would love for you to try! They are made fresh to order - really delicious!! Thanks for the blog. I love it! Is there any way you might be able to link to our site? Try using Ethiopian Harrar with your Sumarta, 50/50 blend, Medium Roast. As you posted below full-city is best. Hey.. there is a grea site from Eight O'Clock Coffee that is offering a sweepstakes to win 12 mystery vacations! Check it out and play every day! This looks great. Tea is the best. Red tea on the grill hmmmmm. Time of day will affect thing. The voltage in your home changes with the load on the electrical system, and a relatively small change in voltage will significantly change the heat output of your roaster, thus the amount of time it takes to produce a given roast to identical batches of beans. I'm sooooo happy you're back...I've missed you. What kind of roaster do you have? I have a Fresh Roast+ and I find that air temp plays a role. Also I live in an older house and if I plug it in a different electrical outlet even that makes a difference.